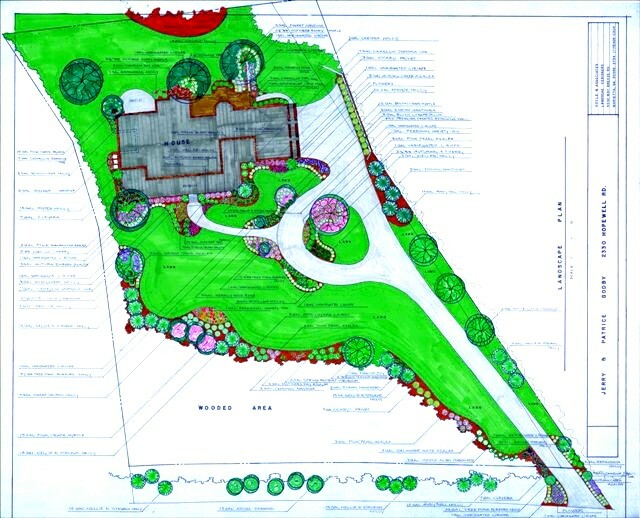 Every Landscape Design is unique for each client and their property. There are no cookie cutter where one fits all. The following examples shows a wide range of styles and each solved site problems while creating beauty and enjoyment for each family. This design was for a big lot. That needed privacy along the right and back property lines. The front had a steep drop from the sidewalk to the lower lawn. The biggest challenge was to tie the house to a outdoor fireplace and large terrace in the left back corner of the yard. The plant selection will provide color at different times of the year. The front design changes included a additional driveway that ties on to the existing drive and extends to the side street, so they would not have to back from existing drive to the street. It would also provide parking for visitors. This homeowner wanted a very large patio with a pergola over the patio portion near the back of the house. A fish pond, a indoor entertainment center, and a putting green were included. Family and friends can enjoy this great backyard for many years. 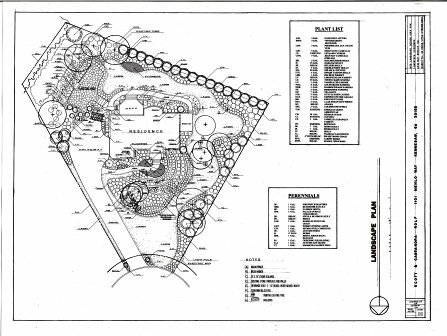 This client had a huge lot to landscape. First, the area in the front of the house was flat causing some drainage concerns. A NDS Pro Flo-Well units were installed in the ground out in the yard. The downspouts were connected to the Flo-Wells to eliminate possible standing water near the house. 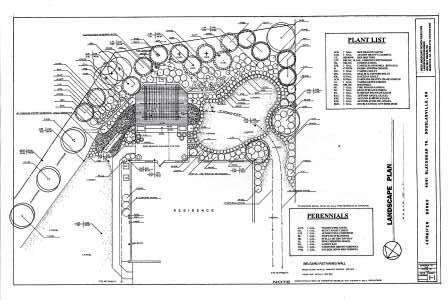 The front entrance was formal, so the plantings were designed the same on both side of the entrance walk. The property line plantings on both sides of the large yard were designed to screen off the properties next door and provide a proper framed setting for their beautiful home. The backyard design included a large patio with a porch structure over the top. A hot tub with a Pergola surround by great selection of small trees and shrubs that will provide color year round. This house site had a steep slope, sloping down toward the house with a very steep driveway. A series of retaining walls were designed with steps that tied into the walls allowing visitors to walk from the street level down to the house. New front walk design near the house and an additional parking area was also included. Annual Color flower beds were located on both sides of the front entrance to provide an welcome sign to the home. This backyard had a big elevation change from the house into the backyard. Luckily, the site for the pool area and the right side children play area was on the same level. Retaining walls were designed to fit the existing topography and allow the family to enjoy the entire backyard. Steps from the side deck were designed to fit into the retaining wall construction while allowing excess to the upper lawn along the side of the house. 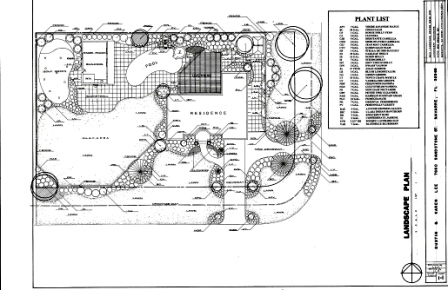 A drainage system was designed to prevent any runoff water from running into the swimming pool and the children's play area. All drains were piped into the back wooded area. The front sidewalk was re-design so it curves around to the drive allowing a larger planting area near the house. 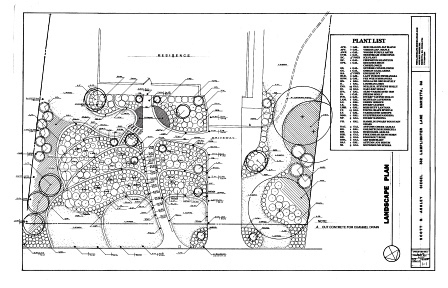 The planting design flows contentious through the entire yard to provide unity. The large lawn area on the right side of the house could be used for family games. The tree placement helps to definite the yard and helps to tie the house to its surroundings and give the family privacy. A small arbor over the sidewalk leading from the driveway gave family and friends a grand entrance into the backyard . 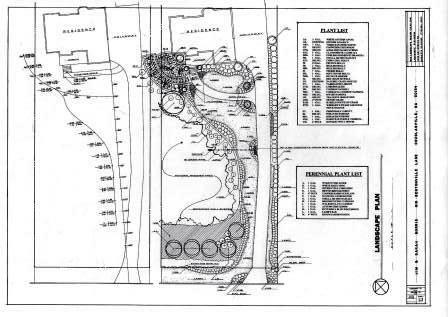 The backyard had some major drainage issues which had to be solved in the design process. The landscape plan also included a large flagstone upper terrace area with a outdoor fireplace and a deck on the back of the house. The entire front yard is in heavy shade, so the only grass areas were designed near the street. 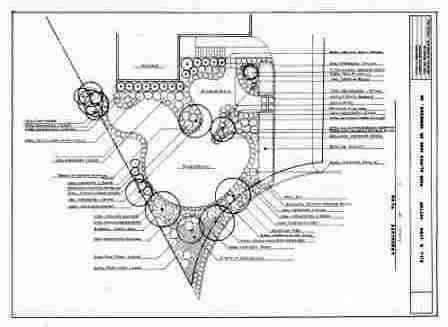 Azaleas, camellias, hostas and other shade loving shrubs and ground covers made up the plant selection for this design. A new brick sidewalk that curve through the ground cover to the front door with a special ground cover area in the shape of a patio provided a great look for the front entrance for this home. The front yard of this home had no definition because the heavy shade prevented the homeowner from growing grass. 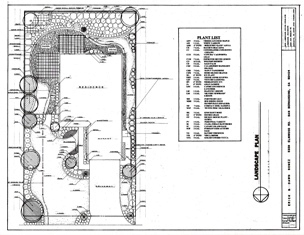 Concrete wall blocks were designed to give the yard the shape like the plan shows. The large open area was mulched with a different mulch material. Only shade loving plants materials were used in the design. 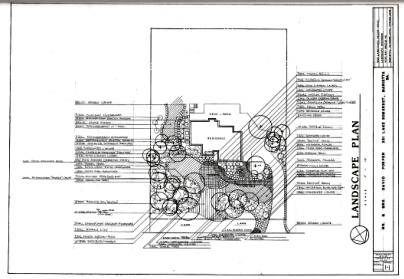 The large circles indicate the existing trees that provided the dense shade. 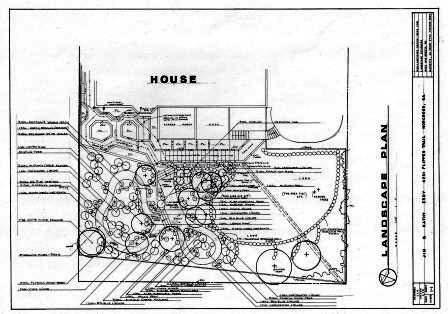 This formal designed home with large existing trees was the starting point for this plan. My design ideas included a 2 car parking area near the street and a semi-formal walk terrace area leading up to the formal front stairs. A white picket fence across the front just inside the parking area. The plantings included shade loving shrubs like azaleas, camellias, tea olives and low maintenance perennials. The backyard included a large cabana, large water fountain within a brick terrace patio and a cottage garden plant selection. A great entertainment oasis for many family parties. This property had major drainage problems that had to be solved or the design ideas would be destroyed during the next big rain storm. The above plan shows the existing elevation that are a must to have before the design could be started. You must know all existing site conditions before anything is started. The existing conditions dictates the design ideas that you have to work with for each job. 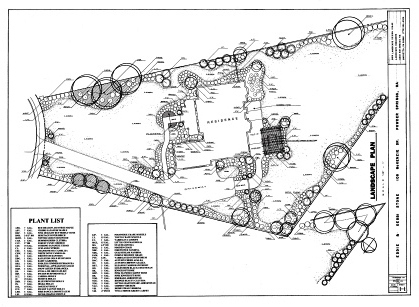 A large L shaped home on a 3 acres site. The landscape in the front is a adjacent to the house. This design was focused to the backyard. A large deck was designed for the main level of the house with a beautiful patio on the lower level. A large Swimming pool with separate Spa area and a separate water feature. The swimming pool was higher than the Spa fountain area, so a retaining wall was necessary with stairs between the two levels. The plantings were design to give a maximum amount of privacy to this big outdoor entertainment area. Several seasonal color areas along with flowering shrubs provides a ever change look with the different seasons. 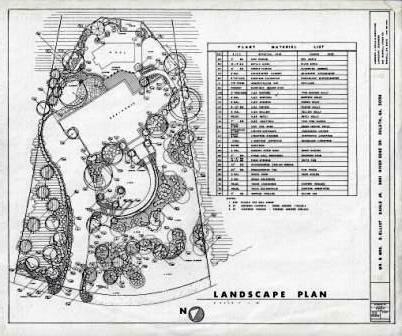 Narrow lots present a challenge while designing the landscape. First, the trees you select should have a small growth habit both in growth height and width. This home was one story and L shaped as you can see in the drawing. 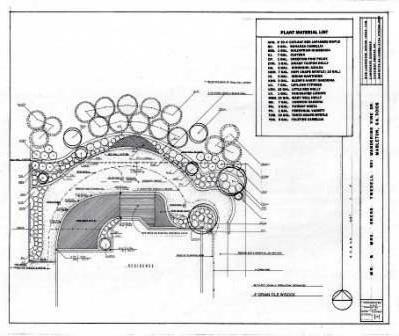 Crape Myrtles and different small growing fruits where selected for the design. Next When designing California landscapes, You must select plants that are Fire Resistant. 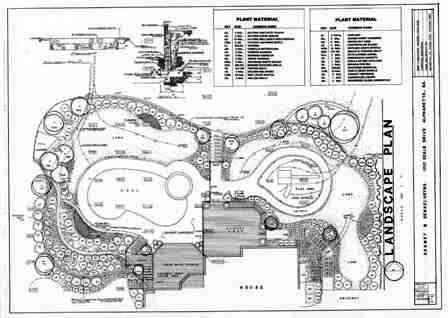 You need to have the plant list from the local city or county in order to make the correct choices for your landscape design. 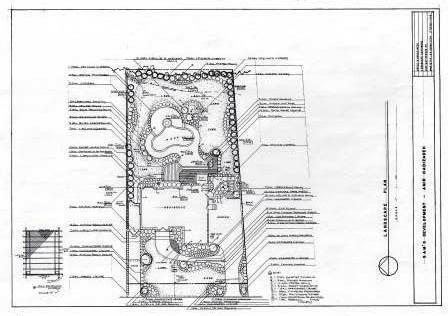 The homeowner has to get approval of the final plans before the job can be installed. 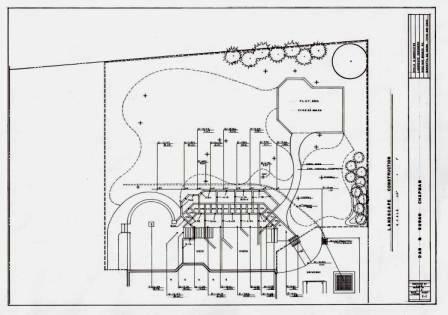 The back of the property had a large hill sloping down toward the house resulting in a drainage problem in the backyard. A 4 ft. high retaining wall was installed at the bottom of the hill. A french drainage system was installed and the pipe was extended to the front street to solve the drainage problem. 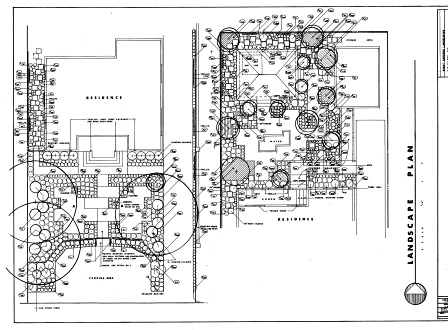 The Two patios as requested by the homeowner with garden structures overhead were included in the above design. The far left side of this backyard is sloping toward the house. A retaining wall was designed at the bottom of the slope to solve the drainage issue from the hill. Stairs was included through that retaining wall to allow excess to a path on the upper level. Existing trees provided heavy shade in this area. Shade loving plants including Camellia sasanqua, Native Azaleas Hosta, Ferns and Liriope were the plant choices. When you have drainage problems near the house, solving this water problem may be coming from the roof. Gutter size and the number of downspouts must be determined by the size of the roof area. This house had a waterfall coming over the gutter during heavy rains. To solve this problem, another downspout was installed. The length of the gutter and the roof size dictated adding one more downspout. 12 x12" drain boxes were installed in the ground below each downspout and a drain pipe connecting the boxes and allowing the water to flow to a lower area away from the house. I mention that this area had lots of trees. The leaves will wash out of the gutters into the drain boxes where they can be cleaned out, this prevents the drain pipe from clogging up. This design was a big challenge because the existing brick columns were constructed at different heights along the street at the subdivision entrance with a plastic horizontal fence running between the columns. The main street sloped down the hill so I had to calculate the correct height for each column as they stepped down the hill. New stone caps were also selected and installed. 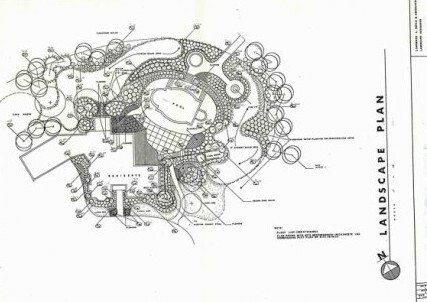 Another design sheet showed the stone wall as it stepped down with the wrought iron fence following the lower wall pattern. This lake was designed in a area of Indiana were the water table varies from 18" from the ground surface to 36" in the middle of the summer. 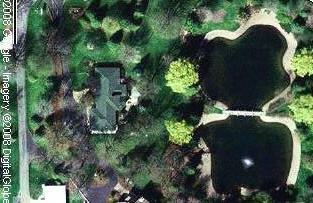 The house was existing up on a hill, so the back of the house was looking down on the lake site. 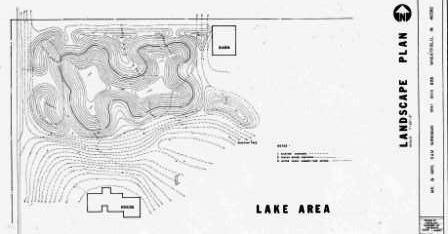 The existing contours are shown by the light lines and the lake design are dark looking. Approximately, 12,000 cu. yds. of sand was excavated from the lake. 2,000 cu, yds. of sand was used to contour the flat site surrounding the lake. The remaining 10,000 Yds. was sold to another near by construction project which help pay for the lake excavation. The lake design above was completed in 1983. This picture was taken in 2008. 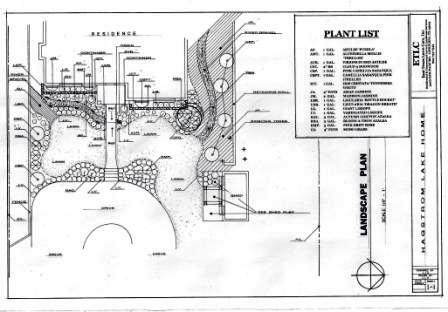 Retaining wall and step construction designed according to existing site grades. Grade shots were with a transit from the upward drive elevation to the lower patio elevation. 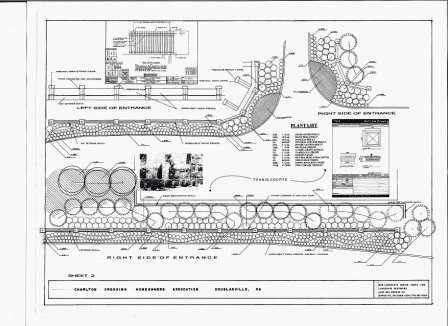 When designing stairs and retaining walls, you must know all existing conditions present on the site. Click The above link to get dreams started!